The first of two new chapters in the Lara Croft saga comes exclusively Xbox 360 next month, as Eidos announces a February 10th release date for the Tomb Raider: Chronicles Beneath the Ashes DLC. First announced back in October of last year and originally slated for a December release, Beneath the Ashes finds Lara returning to the ruins of Croft Manor to discover a massive series of caverns and crypts located underneath the rubble. While I am not sure what happens next, I am positive it doesn't involve Batman - but I want it to. If adventuring isn't enough for you, the expansion DLC also comes with six new outfits and 125 achievement points. Not seeing a price on this in the press release though...just an indication that the codes for the pack will also be available at GameStop, which is nice for those of you who enjoy the whole going outside thing. The second DLC pack, Lara's Shadow, will launch a month later on March 10th. Redwood City, Calif. – Jan. 22, 2009 – Eidos Interactive Ltd, creator of some of the world’s leading videogame properties, today announced that Tomb Raider: Underworld™ – Beneath the Ashes, the first of two brand new downloadable levels in the continuing Tomb Raider™ adventures of Lara Croft™ will be available February 10. The second level, Tomb Raider: Underworld™ – Lara’s Shadow, will follow on March 10. Containing new gameplay levels and content for Tomb Raider: Underworld™, both packs will be available exclusively on Xbox LIVE® Marketplace for the Xbox 360® video game and entertainment system from Microsoft®. Offering a new adventure specifically designed to extend the Tomb Raider: Underworld™ experience, Tomb Raider: Underworld™ – Beneath the Ashes sends Lara back to the remains of Croft Manor where she uncovers a massive series of never-before-seen caverns and age old crypts used to protect and hide a deadly source of power. The pack will also contain six new costumes and deliver an additional 125 achievement points. 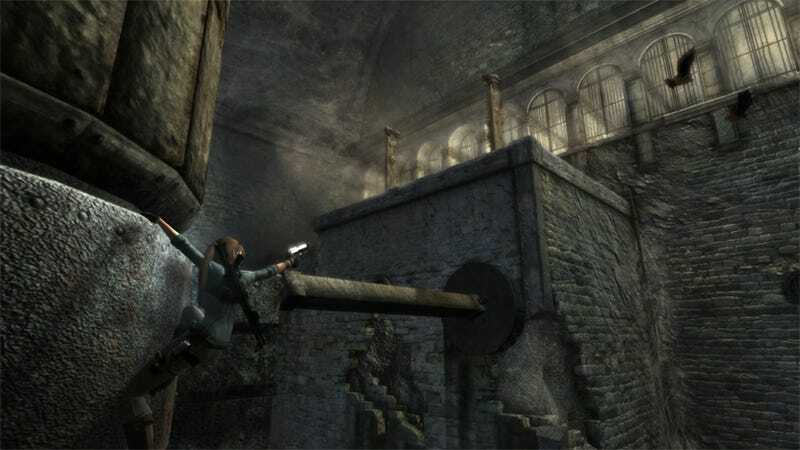 Tomb Raider: Underworld™ seamlessly blends exploration, grand scale puzzle solving and combat, taking players on an archaeological journey to the ancient nether worlds of the Mediterranean, Thailand, Mexico, the Arctic Sea and more. As fearless adventurer Lara Croft, gamers uncover proof of the existence of the Norse underworld and the mythical Hammer of Thor, and embark on a perilous journey towards a forgotten power that, if unleashed, could lay waste to all of civilization. Lara’s latest adventure introduces scores of new capabilities and state-of-the-art gear, including an active sonar map, multi-purpose grapple and an all-terrain motorbike. With fresh moves that are more intuitive and realistic than ever before, players must master these in order to navigate through treacherous environments and defeat a range of hostile enemies. Xbox LIVE is the largest social entertainment network on TV with more than 17 million members across 26 countries and nine languages. Xbox LIVE is seamlessly integrated throughout the entire console experience, making it easy for users to find the friends, games and entertainment they want from the moment they power on their Xbox 360 system. The online entertainment network offers hundreds of multiplayer games, downloadable games via Xbox LIVE Arcade, free and premium playable game demos, music videos, TV shows and movies, as well as new game levels, characters and vehicles for all their favorite retail games. Tomb Raider: Underworld™ is rated “T” for Teen and is available now. The game was developed by Crystal Dynamics and is published by Eidos Interactive Ltd and co-published in North America by Eidos Inc. and Warner Bros. Interactive Entertainment. For more information, visit the official site at http://www.tombraider.com.